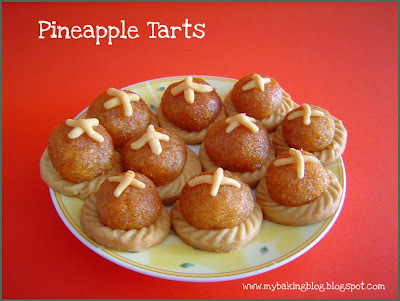 Lately, I had been searching for Pineapple Tart recipes. I found 4 of them, and tried out 1 this morning. I made the dough last night actually, and made 5 tarts. But I decided the dough was too soft and left it to chill overnight. This morning, it was too hard and could not be rolled, so I let it soften a little, and while waiting, I made some muffins for my breakfast. I love the way cinnamon always fill up the whole kitchen with its fragrance...it's irresistable...and they always pair up so well with apples and brown sugar. I had halved a Apple Cinammon Muffin recipe I found on the net...but I had forgotten to half the amount of butter!! It was too oily of course, but the muffins still managed to rise and were actually more fluffy and light than I had expected. The taste was good, except for the excess butter which soaked the paper liners. Therefore, I will only post the recipe when I make it correctly next time. 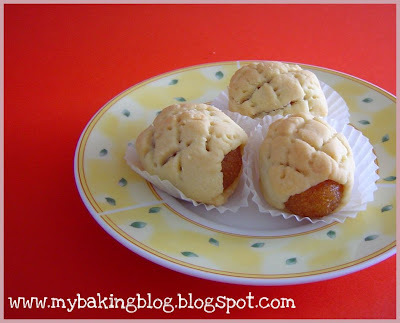 While they were in the oven, I went back to work on my pineapple tarts. I know I know, Chinese New Year is in January next year. I just want to see how my attempt will turn out, so that I have time to try different recipes and can plan to make some for family and friends. For the pineapple jam, I use ready made ones since this is my first attempt, and they tasted not too bad, though a little too dry. Perhaps due to humidity, the dough soften easily and quickly, I had difficulty removing them from the mould without distorting their shapes. It got better as I continued the second tray of tarts. I guess I was too generous with the first tray of tarts, and the balls of pineapples look inproportionately big as compared to the tart base. When I look at them, the term C-cup boobies kept appearing in my head! Oops! When buying pineapple tarts from commercial shops, I usually prefer the open tarts, because there usually is very little filling in the closed ones. But I made 3 closed ones and fill them with a big ball of filling, just for the fun of it. The tart shell was crumbly and melt in your mouth, with a slight buttery taste. Personally, I am very glad with this attempt and my chief guinea pig (aka my husband) agrees. I'll check the verdict with my other guinea pigs tomorrow. 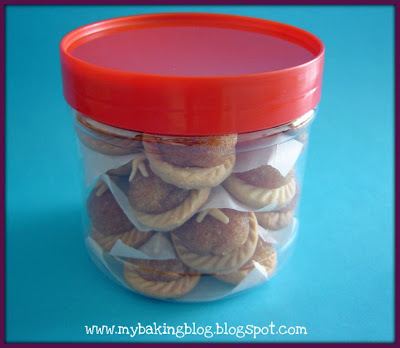 I also put them into the typical plastic containers with red lid, just for the Chinese New Year effect. I'll share the recipe once I have tried others and decide which one I prefer. Bimmer,just see your vanilla apple cake in my blog..thanks for this recipe. They are so cute looking! lol I cant wait for you to share the recipe. These look yummie!